We finished our Creation Study this week and added in a memory verse to go with our letter of the week. “B” – I am the bread of life. This memory verse was much easier for Cricket. She wasn’t thrown off by thought of having an apple in her eye, and could just learn the verse. By the end of the week she was saying “I bread of life” on her own. She could say it correctly and with the verse with prompting. I think true memorization will come later for us, but this practice and exposure is good! Cricket is doing a great job recounting the creation story at this point. We continued to use the coloring sheets to prompt and lead our discussions. When we got to the day 6 sheet we had to readdress an ongoing issue of anger and sadness. The coloring sheet showed a dog, Adam, Eve, and a giraffe. Cricket was convinced that Adam was God, despite anything I said. She started discussing how our dog, M, is in heaven with God and as she talked I could see the anger rising. I abandoned the creation lesson, and gathered her in my arms to discuss god’s love. She is still working through her grief and understanding, but each conversation makes it a little easier. Cricket really liked singing He’s Got the Whole World in his Hands and talking about that concept. I got the Seeds of Family Worship Set this week that I won in a contest, and we have been listening to the Seeds of Courage cd as we do our other work. So far Cricket’s favorite is Call on Me. Please visit 1+1+1=1 and Raising Rock Stars to see what other moms are doing! I can not tell you how much I love this site and what her ministry has meant to me. I had to throw away some cupcakes and Cricket saw them in the trash can. She was looking at them, obviously heartborken. It was sung VERY dramatically too! This week did not go at all as planned. I literally scratched through and rewrote my plan countless times. Here are some of the problems we encountered: I had much more of an unflexible “schedule” for work this week that moved and pushed when we could do school; I was also trying to shove our normal week into four days; Cricket had an unusually grouchy and problematic day; followed by a sick day (ah-ha); and with all of these other things going on I was being quick tempered and impatient. To fit school in on Tuesday (our grouchy and busy day) it ended up being done at our dining room table while I also tried to cook dinner. Let’s just say this was not my proudest moment. I was almost in tears when hubby got home. He stepped in though and patiently worked with Cricket on writing her letter b’s. He actually got her to hold her pencil correctly, or at least a lot closer to correct! Our letter this week was “Bb”. Our focus was bears, but just like last week we also incorporated lots of other b words into our studies and activities. We did our hooked on phonics book, talked about the b sound, traced it, wrote it, and made it. Her favorite activity by far was playing with shaving cream. 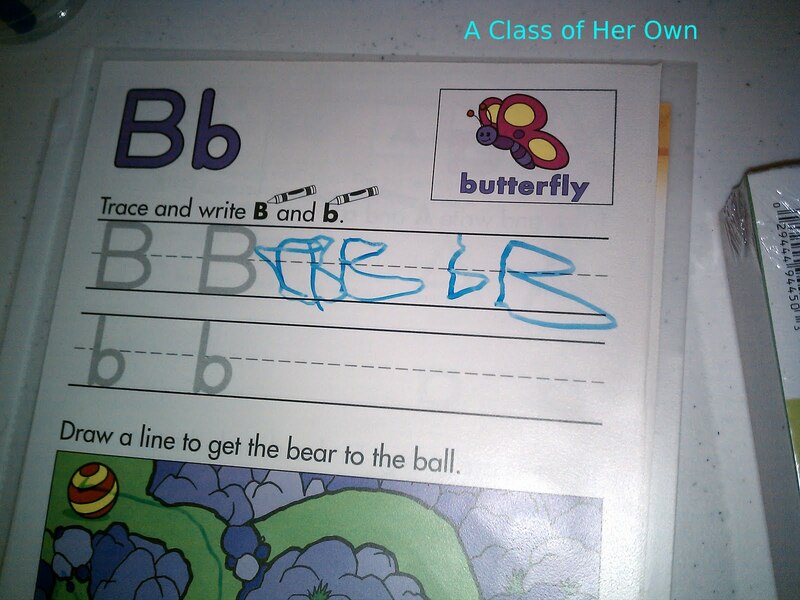 We wrote a couple of letter b’s in there, but primarily she just played. TIP: We got the shaving cream out initially to clean up a mess from another project. Did you know it would do that? Our bingo markers bled through onto our table, so I just sprayed out the shaving cream and rubbed it around. TA DA clean table followed by fun. It also got out some random marker and crayon marks! We attended our first library story time on Tuesday of this week. The librarian read The Little Engine That Could, and the kids got to make a train after wards. I was amazed at how many people were in that little room (it only made me slightly claustrophobic). Cricket seemed to enjoy herself though, and we found some great books for the week. They actually had the books I was looking for this time too! I picked up We’re Going on a Bear Hunt: Anniversary Edition of a Modern Classic and Bear Snores On for our bear theme. We loved, loved, loved Bear Snores On! I also prepared a lapbook for Brown Bear Brown Bear that covered sequencing, the alphabet, matching, and numbers. I get the resources for this lapbook at 1+1+1=1. We read this book and did these activities through out the week. I also found an Alphabet Bingo game at Target’s Dollar Spot (one of my favorite places). It was age rated 5 and up, but I assumed correctly that I could gear it down. I just drew out one of the clues and read it. Then I’d answer it if Cricket couldn’t (she actually got a few), and she would check her card to see if she had the letter. She could do this independently since it showed upper and lower case. We primarily talked about the concept of zero though, and I happened to have some more zero or one worksheets that helped. 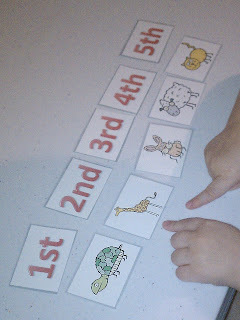 We also started working on ordinal numbers. I will be doing this as we learn 1-10 since Cricket can already count to ten and read those number. I am using the awesome resources from the member only site at 1+1+1=1 for this! Cricket really enjoyed the powerpoint, and we are using the print outs too. Cricket also did the shape sort from this site. I happened upon the book Math Fables at the library. I enjoyed reading this book to Cricket, and I think I will do more with it next week. I would love to do a version of a five in a row. I will see what I can come up with and share it! We did a mini color mixing experiment, which came about from my explorers interest. She wanted to play with water. So we did pouring, funneling, and then color mixing. 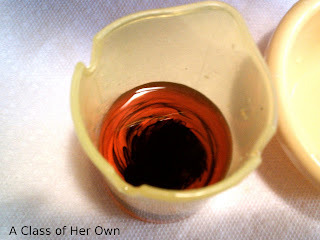 Crickets favorite part was when I first dropped a color in and it swirled with what was already in the cup before we mixed them. We also started trying to grow a plant and we will be observing it as it goes. I have a black thumb though, so I can only hope the plant will actually grow! Cricket attempted to do a “sunny day activity” I found on another site. Unfortunately I can’t find or remember which blog I saw it on. Anyway, Cricket put a collection of items on a sheet of dark blue paper, and left it out in the sunshine for a couple of hours. In theory, the sun should fade the exposed paper and create outlines of the items you laid on it. Our sunny day turned cloudy so it didn’t work great, but Cricket still had fun! Cricket played lots of hide and seek this week. She also swam at Mimi’s. Cricket also had week two of Super Crickets at our local YMCA. I’m looking forward to adding regular Gyminee Crickets back in next month for more fun and play, and I think she is too! I got out her ball pit balls and blocks this week. We talked about how these started with the letter b and just had fun playing! Day 2 of having the ball pit out, Cricket spent at least an hour saying “to infinity and beyond” and then running and jumping/diving into the pit. She is in love with Toy Story at the moment! Little People were once again a hit. I think Cricket spent most of our “sick day” playing and making up stories with her little people. Cricket also worked with stickers and stamps. This particular sticker sheet was done during a car trip, and in addition to fine motor I used it to discuss color, expression, and facial features. Monday, she had NO interest in hearing the creation story again. I am really going to have to find a good children’s bible to make this more accessible and friendly. The coloring sheets were very helpful, because as she was happily coloring I could read the part of the verse at the bottom of the page. She also did well with an overview of the days. I tried to introduce the matching game (ex: day 1 to image of light and dark). Cricket begrudgingly did this, but she asked for the cards from last week the whole time (picture and number on same card). Wednesday, was such a blessing after the week we have had with our bible study. Well, actually I think part of the blessing occurred Tuesday when I found my old children’s bible! I used it Wednesday to read the creation story from, and it was like a new child. Cricket listened attentively, was engaged, and randomly reached over to hug me during the story. After reading it she asked “Can God come to our house?” I thought that was the sweetest thing! I explained that God (the holy spirit) is always with us living in our hearts and that God (the father) is always watching over us. She seemed to accept and understand that as an answer. As a side note when I got out our memory verse Wednesday, I asked Cricket if she remember what it said, and she told me “Yes, Keep an apple in your eye.” I was impressed she remembered that much, and thought it was cute! Cricket actually did really well overall with reviewing the memory verse, and at least knew part of it. I thought she would enjoy taping it together, but she just wanted to cover the words. (That is Mimi’s helping hand you see- this was the day she joined us for school). 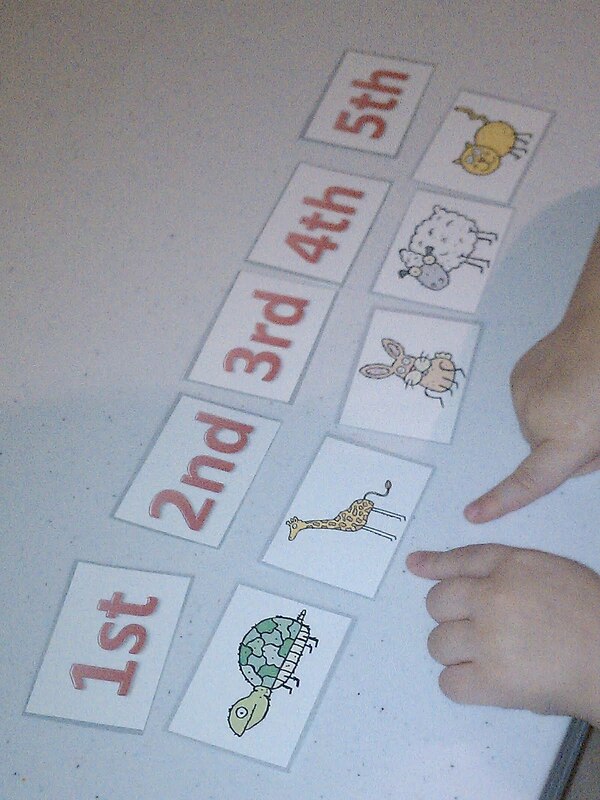 On Friday, I gave Cricket the numbered creation cards again and she put them in order independently. She also retold the story of creation on her own as she gave me each card back! YAY! I also had Cricket draw the pictures for the lapbook cover: herself, family, and the world. Her little stick figure drawings were too cute! I got my inspiration and ideas from Carisa at 1+1+1=1. 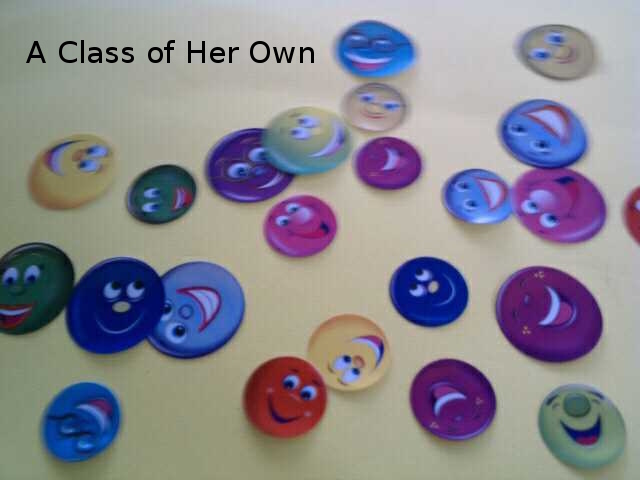 I got my resources from Totally Tots and Christian Preschool Printables. Cricket actually got to have spend Monday with her Mimi today. This also means mommy actually had to attend staff meeting, but that’s not what this is about! Mimi asked Cricket yesterday if she would like to go there today so that she could swim, and of course Cricket said yes. So I packed her up and dropped her off. I seriously don’t know how other working moms do this every day, I always forget something (like I took breakfast but not lunch, oops). Mimi and Cricket spent the morning swimming and observing nature. Mimi also found and pointed out every “b” thing within sight, and there were a lot. Cricket also worked on the letter sound, saying all these words, in a fun way! Inside Cricket read a book to Mimi, and investigated Mimi’s cat. She spent some time with cat and observed where she sleeps, eats, and potties. To end it all Cricket worked on story telling, by recounting her day to me when I picked her up! Cricket got a slinky this week and I wanted to show her how it transferred energy. I think this would almost fail into failed experiment, because it only worked twice (once for my husband and once FINALLY for Cricket). Evidently our stairs are too wide for the slinky to go down like it should. However, when it finally worked it was a big hit, and fun was had by all! Cricket was so excited to be in her new school room, not to say that everything went well though (see Raising Rockstars). She even wore her special first day of school dress, and let me take some pretty pictures. She was also initially very excited about her prize, silly bands, but they turned out to be a flop with my kiddo. I also pretty quickly modified her seat by adding a booster, so she could work at a more comfortable level. I added a couple of things to our daily routine. We added a song about our letter (this week was the ants go marching), and we started our 100 days of school count down. Cricket decided she wanted to x through the numbers as we go, and this works as well as anything else would have. She cracks me up trying to do this though, her little tongue almost always sticks out as she concentrates on getting the x just right! We started our letter of the week studies with the letter a. My intent was to do a is for apple, but I quickly realized focusing on one a thing was not my style. I did use all the apple things I had planned, but I also ended up incorporating other a words. This included adding “a is for Auburn”. We had an Auburn day when she wore her Auburn University cheerleader dress, colored worksheets, and worked on our WAR EAGLE! I found this worksheet that let’s you change the word, so instead of cheerleader or football you can type in your team name. We are continuing with Hooked on Phonics and completed the workbooks pages on lower case a, “a” sound, and writing the letter Aa. 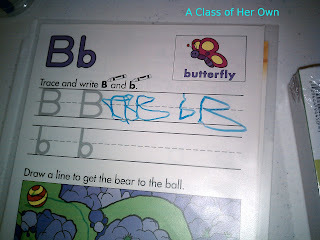 Other letter activities were tracing, printing, and finding the letter in her name. Cricket also learned the sign for the letter a, and we practiced some of the signs we had stopped using (please and thank you). Our major art project was also letter of the week. I had printed the large letter A with the intent of getting her to do a collage, and I wanted to do an apple print painting. Our time was running short though, so I combined the two! I thought she would fill in the A with apple prints, but that’s not what she wanted. So Cricket made apple prints around the A and then painted the A with another color. I will say I had to convince her that using the apple to paint would be fun, and that there would be more apples to eat. On Monday, we went to the library to look for the books to support my a is for apple lesson plan. I was unable to find ANY of the books I was looking for, but I did stumble into some great finds. The Apple Pie Tree by Zoe Hall started and ended by discussing making apple pie from an apple tree, but the majority of the book was about how the tree changed with the seasons ( I may revisit this book, when we do our seasons unit study). I loved the easy reader I picked up though: All Aboard Science Reader Station Stop 1 Apples: And How They Grow by Laura Driscoll. It was very much on Cricket’s level, and it actually taught about apples and how they grow (Mommy learned something too)! I am going to be searching for more of this series. Our number for the week was zero. I think by the end of the week Cricket had finally grasped this concept. The 0 or 1 worksheet really seemed to help! She also did a printing sheet, but as you can see she digressed into coloring them in. We also worked on concepts of above and largest. As you can see in this picture we are still working on correct grip. For science, Cricket did this great animal sort game. She did great with identifying the ocean animals, but had a little trouble with farm versus zoo. I understood some of the confusion though since we have seen “farm animals” at zoos before. For those animals I explained that they could be at either place, but also why they would be on a farm. This week we discussed Alabama and Alaska. We spent more time on Alabama then I plan to spend on the other states, because this is where we live. Cricket did coloring sheets for each state, and we identified them on our map. We read the book Rookie Read About Geography: Alabama. It did cover some of the things I needed it to, but let’s just say I was disappointed. I also got out Cricket’s Alabama map, but she decided this would be a good play mat! Since Cricket is starting a new harder gymnastics class this week, I wanted to work on her gymnastic terminology. This week we talked about arabesques. Her first class went great by the way: only four kids in the class; we love her teacher; Cricket tried hard; and her only “issue” was with doing flips on the bar. As a life skill, we continued to work on sign identification. We have been working on street signs for awhile, and Cricket can identify a stop sign. This week we added restroom signs, and we observed and discussed them. My second favorite little girl (not so little anymore actually) gave Cricket her collection of Betty Spaghetti Dolls. Cricket has LOVED playing with them all week. We talked about the parts of the body, and they are great for developing fine motor skills. It also inspired a lot of creativity! Cricket had great fun with her cutting activity. Downside was she didn’t want to stop cutting. I finally had to do a countdown, and then there was still pouting. Cricket also worked on lots of puzzles, coloring, and stickers. She also has a new fascination with making tents and hiding in them! This week was also daddy’s birthday, so we made him a card and cupcakes (fine motor skills, pouring, measuring, stirring, spooning, spreading, and sprinkling). I also used my guided imagery for the first time, and this really seemed to help Cricket following along. I have been checking out everyone’s favorite books at the HomeSchool Village, and I thought it would be interesting to see what Cricket would say. After a slight pause, Cricket said “Berenstain Bears”. I think this is as close to a favorite book as I am going to get from her, and truthfully these are her go to books. She told me she likes these books best, because she likes brother bear and sister bear. We will return to Mondays with Mimi next week! I didn’t have staff meeting this week so, once again no Monday with Mimi. However, Mimi decided to come observe school and play today! She liked watching what we did for school, and Cricket LOVED showing off for her. In addition to what we had planned for the day, Mimi brought some prizes with her. She brought me our old set of Childcraft “Encyclopedias” and I’m hoping these will be a rich resource. Mimi and Cricket had fun looking through the animal book today! She also brought Cricket a set of interchangeable letter stamps, and we tested out the A stamp. We will use these other prizes another day: a perfection game; miniatures (for an eye spy bottle); and play money. After going through these goodies and finishing school we all played hide and seek together. Cricket needs to work on her hiding skills though. She giggles the entire time she is hiding, and today she was so excited she ran into her easel trying to hide under it. She didn’t even realize she had bumped her noggin pretty good until I “found” her, because she was to busy playing. After a few minutes on Mimi’s lap with on ice pack while mommy read she was ready to go again. So we measured her for her costume that Mimi is making! While measuring we talked about how to measure, inches, feet, and I even worked the concept of zero in there!